User Strategies: Acquisition, Retention... What Should I Focus On? Mobile User Strategies: Acquisition, Retention… What Should I Focus On? We would all agree that users should be one of the most important things to take into account when thinking about your mobile business strategy. Today we are diving right into user retention, acquisition and engagement to share some tips on how to improve our strategy towards these topics. Mobile User Strategies – What Should I Focus On? Summing it up – User Strategies: Acquisition, Retention… What Should I Focus On? You are probably wondering what strategy should you focus on in regards to your users. There’s user retention, user acquisition, user engagement… All of them are useful, but which one should we put our effort on? You would say user acquisition, as the more users for your app or game, the better. And that’s right, but why do you want a lot of users that aren’t active and churn easily? Let’s see the basics to determine what aspects should we cover in our user strategy. The simplest way to define user acquisition is to say that it refers to obtaining new users. In order to do that, you want to persuade users to purchase (or subscribe, or simply download) your product (your mobile app or game). 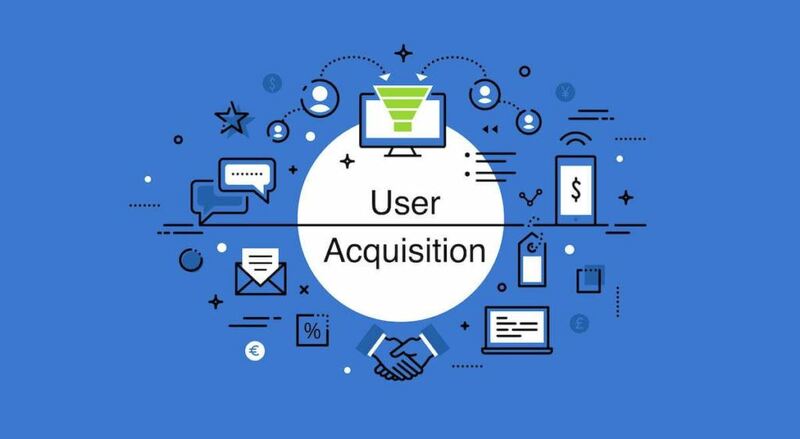 User acquisition can come organically or via paid campaigns, being the latest one of the most important considerations for companies, as they need to contemplate the cost of user acquisition and the value of these new customers. Once we’ve covered that part, it would be quite normal to think that user acquisition is the most important strategies, as you constantly want more users for your app or game. However, if you don’t take good care of your users they can finish your relationship and leave you (which in the business is known as churn). So, without a good strategy, high download rates could be useless. There are several ways to make the most of your user acquisition strategy. There go some of the most popular user acquisition channels. There’s no need to explain why ASO is important for your user acquisition strategy, is there? Let’s go over it one more time: most users discover mobile apps and games via search, but as we always say, ASO is not only search. We need to take into account many other aspects such as browse and visibility in Top Charts. By running an App Store Optimization strategy you’ll get more visibility and, therefore, more users will be keen on downloading the app. There are many things to optimize in your app store listing, from the textual fields (Title, Description, etc.) to the visual assets (icon, screenshots, etc.). If you are new to it, check out this post with actionable tips to start optimizing your app listing. Also, for further insights don’t hesitate to download our eBook on App Store Optimization! According to a study carried out by Smart Insights, nearly 62% of mobile users are active social media users. Therefore, it seems a good idea to run paid marketing campaigns through social media to get more users. There are many channels to choose from: Facebook, Instagram, YouTube, Twitter… Let’s start working on your app promotion strategy in social media! Another way to drive more users to your app or game is to have a website on which you can make app promotion. Needless to say, a well-ranked website will help an app to rank better, too. Place banners on your mobile website and look at how new users start downloading your app. Working on your content will definitely help you to get more users. Storytelling and creative content have been proved to be useful, so try telling your own story as a company, share infographics, reviews… This kind of content makes a bond with your potential customers and that should be the core of your app’s growth strategy. There are several sources that can work for you, such as writing a blog about your app’s niche, participating in forums to share how your app can solve a problem for a user or, simply, publish video content. Nowadays we rely on other users’ opinion when it comes to deciding whether to download an app or not. This opens up a new way for app promotion, as you can increase users’ participation thanks to a good engagement strategy (offers, rewards, etc.) and, therefore, get more installs/referrals. Word-of-mouth can also work, but it’s a slower process. Influencer marketing has been an extended practice for the last years. By building a partnership with a popular and experienced social influencer you can get him/her to promote your app or game and, therefore, to drive new users to it. It’s another way of content marketing and social media promotion, as there are many influencers specialized in different channels. These two metrics usually go hand in hand, so we are putting them together. Mobile app engagement and retention provide useful insights to see whether the application or game is being successful or not. The better your engagement / retention, the better for your app. Let’s break them down to get a clear definition. User engagement is an important strategy that helps you determine whether users find your product or service valuable. There are many things to measure regarding engagement: downloads, clicks (taps, in the mobile app scenario), shares, etc. Once you’ve shared your product’s value it becomes appealing to users, and there’s a chance they end up investing in your product by making purchases, subscriptions and so on. Active users: Daily average percentage of users that open the app. Number of sessions: Number of times a user opens the app within a period of time. Session length: Amount of time users spend in the app (from the moment they open it until they close it). Screenflow: it shows users’ behavior in the app: the number of screens visited, screen exits, etc. Retention Rate: It’s a measure of how many users return to use your product after a certain period of time. Opt-ins/Opt-outs: These are the decisions users make: whether to receive/not receive information, messages, notifications, etc. User acquisition costs are increasing every year, as numerous studies have shown us, so you may want to rethink your strategy and start thinking about user retention. We can define user retention as a strategy that aims to encourage users to return to our app. It’s usually shown as the percentage of users that return to an app or game within a certain period of time after their first session (usually within the first month, but the whole first quarter is also considered). As we can see in the chart, only 27% of users come back to the app or game within the first 48 hours after download. Most users (90%) churn within 30 days. So, we need to keep these numbers in mind and think about retention, as only one out of ten turns out to be active users. By that, we mean users that return to our app and use it consistently. App Onboarding: This is a great way of explaining how your app works to your users. A good onboarding strategy can increase significantly your user retention rate. Personalization: Users like having an app adapted to their needs and behavior. If you improve it, you’ll probably see an increase in the retention rate. Push notifications: They are a great way to retain users if done properly. They consist of personalized notifications that aim to engage with users. However, if done wrong, they can be annoying and generate churn. Learn more about push notifications in this article. In-app messaging: It’s a message sent while a user is within the app, normally after they have done a certain action. Remarketing: You can use remarketing to re-engage with users, for example on Social Media or by running paid campaigns. Predictive insights: It is the practice of extracting information from existing data sets in order to determine patterns and predict future outcomes and trends. A/B Testing: It consists of comparing elements variations to see which one drives more traffic and installs or generate, per example, more sales or subscriptions. It makes you more efficient and it strengthens your user retention strategy. Acquisition has been considered the most important mobile strategy for a few years now, as the more users you get for your app or game, the better. However, not many take into account that new users tend to churn within the first days, so it looks like this conception is starting to change. As we’ve seen, we should go a step further after getting those installs and work on engagement and retention if we don’t want users to go away. Loyal users turn out to be more profitable for your business, so maybe you’d like to consider some of the strategies that we’ve mentioned above. Therefore, it’s not easy to pick one strategy above the others, as all of them are really important for your business. Depending on the kind of mobile app or game that you have you may want to put more efforts into one of them, but you surely shouldn’t neglect the others. It also depends on the stage of the product. User Acquisition is a really important strategy at the beginning, but after that, you want to engage with your users in order to show them that your app or game is unique. And this is when it comes tricky because user engagement and retention requires lots of thinking and strategy. So there’s no magic rule regarding users, but there are some things we can do in order to implement a solid strategy to get new users and retain them. Have you liked this post? Leave your opinion in the comments!